Gary's Ballroom Western Dance offers $50 one hour private lessons and group instruction for singles or couples in ballroom and western dance,Rumba, Foxtrot & Quickstep, Night Club Two-Step, East Coast Swing, West Coast Swing, Country Western 2-Step, Salsa & Merengue, Waltz, Lindy Swing, ChaCha Tango, Line Dancing and more. Beginners to advanced dancers of all ages are welcome. Dancing is great exercise for the body in learning social and competition techniques of dance. Step out on the dance floor with confidence and skill. Gary Cox teaches in the Blue Springs School System, Longview College at John Knox Village and Heart of America Dance Centre. 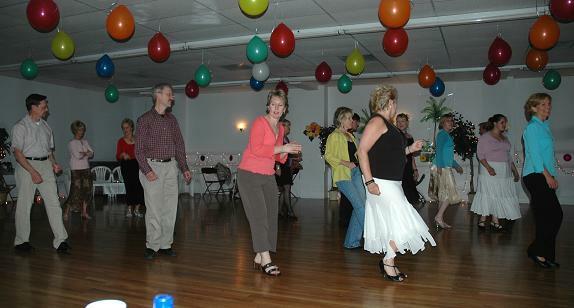 Adults and children instructions allow all ages to enjoy a wide variety of dance styles. Gary also offers a Friday night group class and dance in Lee'sSummit every Friday night so people have a great place to practice their moves! Unlike other studios in town, Gary has no contracts. You pay as you go and you may take private lessons, group classes and have a Friday group class and dance to attend all the time ! The lovely lady in the picture is Gary's mother, Betty Cox. 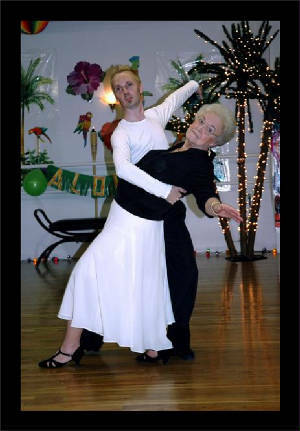 Betty has competed with Gary in competition dance. She still attends his courses and Friday night dances. Classes are a warm and friendly atmosphere with people dedicated to having a pleasurable experience in learning to dance with many partners. Gary teaches a rotation style of dance. That means that you rotate partners. He feels that you excel as a leader and a follower faster because in all his classes there are a mix of all levels that help each other. Gary believes once you learn the basic step in class, you can move to all levels of steps in dance. The focus of each class teaches the steps, the posture and the technique to bring your talent to its peak. Notice picture at the bottom is Teresa, one of Gary's private students and a classy single, who loves her weekly lessons . 8502 people have visited this page since its creation 01/13/06 up to 04/30/06. Thanks for being one of our special guests. 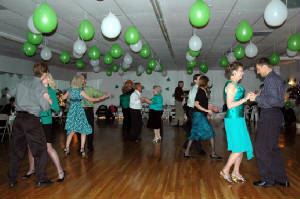 Gary's Ballroom & Western Dance Phone: 816-260-0493.